We are instrumental in exporting and supplying the best quality Bold Groundnut Kernels. These kernels are extensively used for making oil, butter, confectionary items, etc. 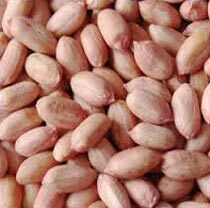 Bold Type Groundnut Kernels are widely acclaimed for their freshness, delectable taste and long shelf life. Also, these kernels are free from contaminants such as pests, dirt, stones etc. We provide Bold Peanut Kernels in quality approved packaging at very economical prices.